UC Santa Cruz has 26 members in the American Academy of Arts and Sciences, 13 members in the National Academy of Sciences, and 35 members in the American Association for the Advancement of Science. Since its founding almost 50 years ago, UC Santa Cruz has been an incubator for new ways of thinking, new ways of learning, new ways of taking action in the world. 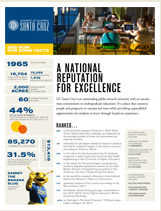 UC Santa Cruz has earned national and international recognition for quality research and world-class teaching. The core strengths at UC Santa Cruz are cross-disciplinary cooperation, commitment to social and environmental responsibility, and an unparalleled record of innovation. UC Santa Cruz researchers are leaving their unique mark on a rapidly changing world. UC Santa Cruz launched its first comprehensive fundraising campaign in 2013 with a goal of $300 million. The Campaign for UC Santa Cruz will provide critical resources to support the Student Experience and the other key initiatives in Genomics, Coastal Sustainability, Data Science Leadership, and the Institute of the Arts and Sciences. In these initiatives and in each academic division, gifts support what education and research mean at UC Santa Cruz: bold, fearless inquiry that benefits our students, our community, and our planet. As The Original Authority on Questioning Authority, UC Santa Cruz ignores boundaries, thinks differently, and achieves through innovation, creativity, and vigor. UC Santa Cruz has been a key player in the Human Genome Project and subsequent breakthroughs in genomics research. The UC Santa Cruz Genomics Institute brings together researchers in a variety of disciplines who are deeply involved in efforts to use the information encoded in genome sequences to transform the practice of medicine and our understanding of biology. The UC Santa Cruz Silicon Valley Campus is a multi-disciplinary teaching and research hub that is home to a master’s degree program in games and playable media, engineering faculty, the new office of industry alliances and technology commercialization, UCSC Silicon Valley Extension, UC Scout, and soon a great deal more. Overall, the vision and goals include creating a portal for championing, catalyzing, and fostering new UC research partnerships, and accelerating the pace of innovation and impact through basic research and knowledge transfer. Based in Santa Clara, the satellite campus is enabling greater partnerships and collaborations among faculty, students, industry, and government. UC Santa Cruz students are regularly interning at companies throughout the region, and the university’s alumni are an integral part of the highly trained Silicon Valley workforce. Visit the UCSC Silicon Valley Campus website.